Faster, sleeker, and more volume than ever. Toshiba’s new high-end A3 monochrome line-up has a sleek new design, on the outside and inside. With an impressive paper capacity of 6,020 sheets and innovative functionality from the e-BRIDGE Next controller, users can create crisp clean monochrome prints at speeds of up to 85 pages per minute. 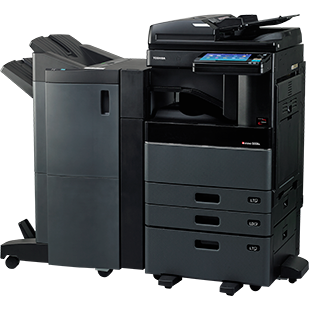 High-volume A3 multifunction systems with impressive monochrome document output at speeds of up to 85 ppm. Support of cloud and mobile printing to give you the flexibility you need in today’s business world. A new 9” tablet-style touch screen with an embedded web browser is easy to use and customisable to meet your needs. A high-capacity Dual Scan Document Feeder enables users to process documents at speeds of up to 240 ipm.